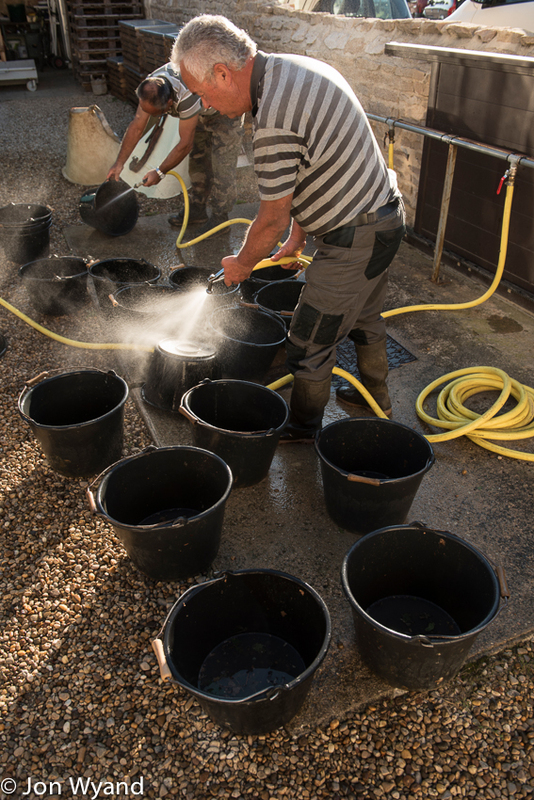 Well we have heard so much this year about the disasters befalling Burgundy, indeed there was a double page drawing in Decanter of winemakers queueing to sell vineyards to negociants in order get through their grape famine. Frost, hail, rot, what a year. 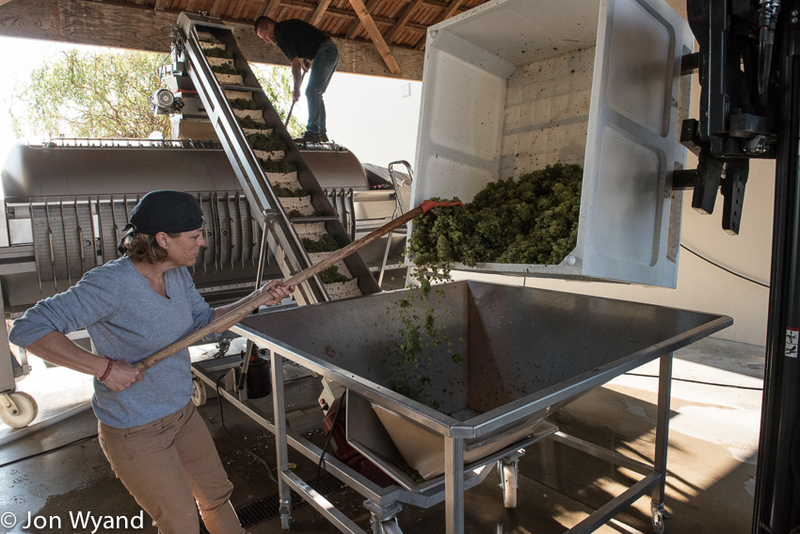 In the end the winemakers’ skill and tenacity along with a redeeming August come to the rescue and what grapes I saw and was given to taste looked excellent. We must wait and see how everyone survives. 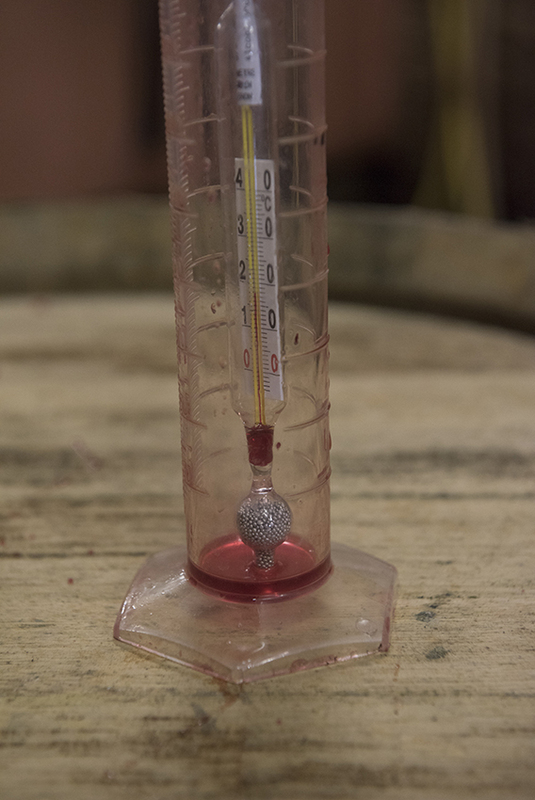 Winemakers don’t like to comment until the wine is in the barrel, neither should we. 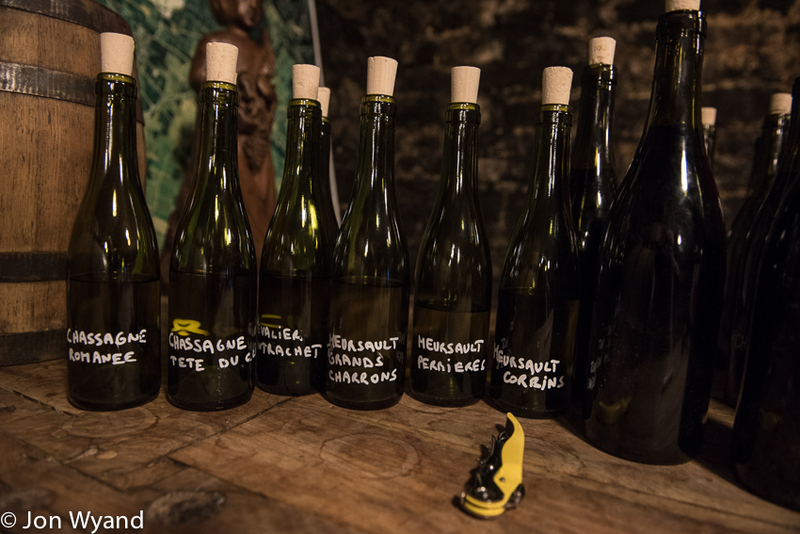 One winemaker in Côte de Nuit was listing his losses on his fingers with some virulence, including all his Chambolle-Musigny premier cru but even he had not lost the 75% that I have come across. There is no doubt these guys have had a hard time and have no alternative but to increase prices, but they know how that will be received, so this is a year to tighten the belt, shelve future projects and hope St Vincent and St Medard will look kindly on them in 2017. 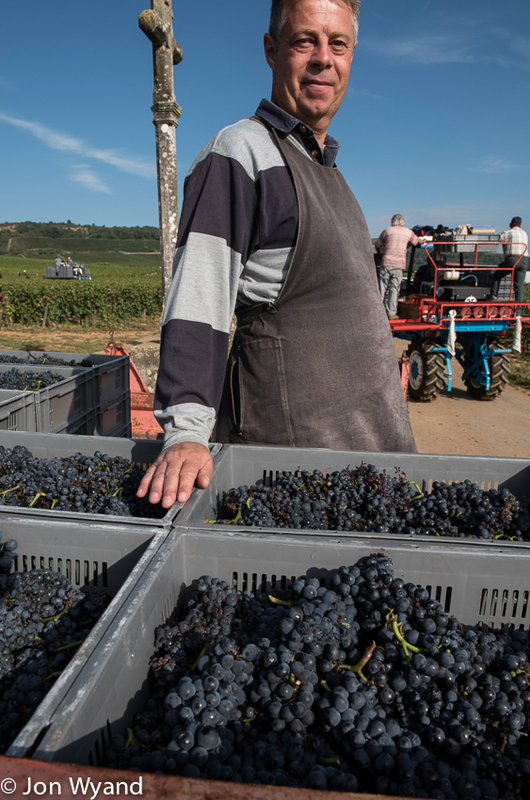 I was to combine visits to Vincent Dancer in Chassagne and Chandon de Briailles in Savigny with other things that have cropped up to take me to Comblanchien, Vosne and Gevrey along with keeping my eye open for some harvest action. It was difficult to anticipate what I would find but at least the weather forecast was promising. Symbol of a small crop…? That’s a bargain, 150 euros new I’m told. 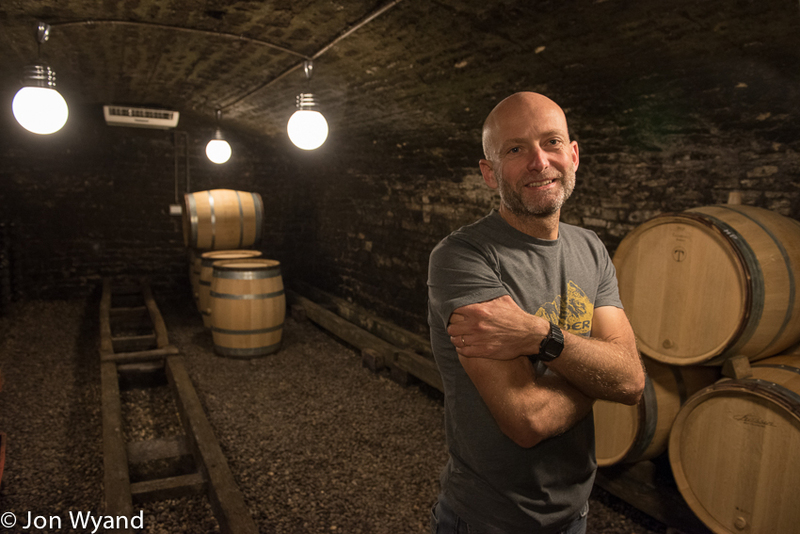 My first encounter of the trip was a positive one, Etienne Julien in Comblanchien. 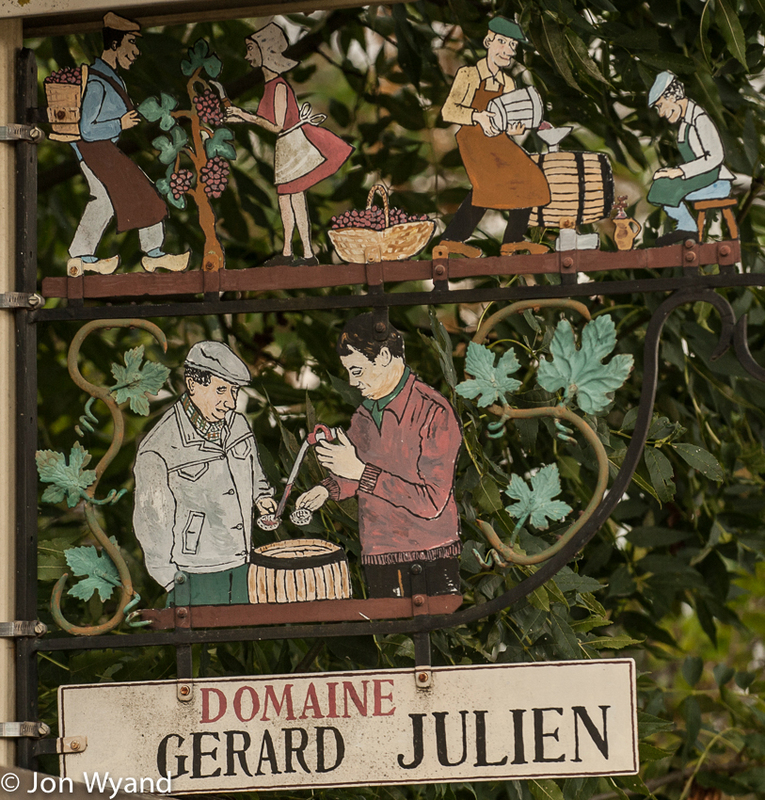 The village is more known for its stone and a wartime massacre than its vigneron population and the Domaine Julien sign does not stand out very well. 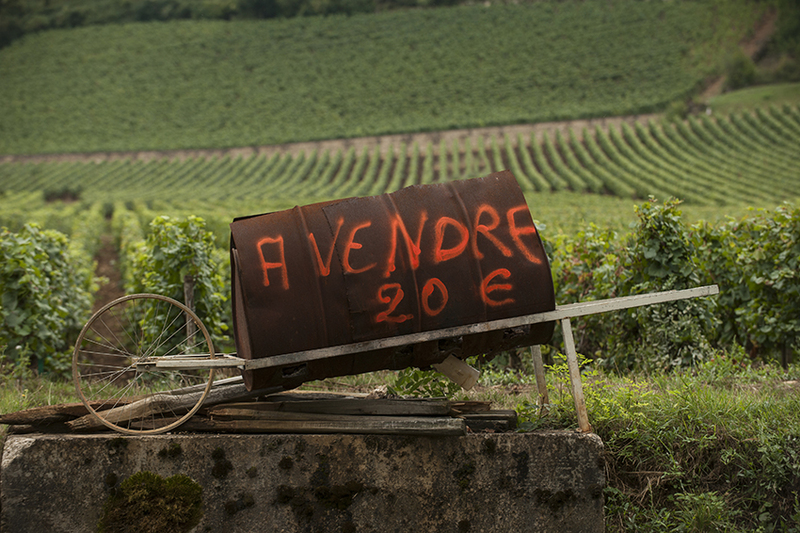 Which is a pity as it is well made and humorous, resembling many a vigneron sign I have seen in Champagne depicting the metier of the winemaker. 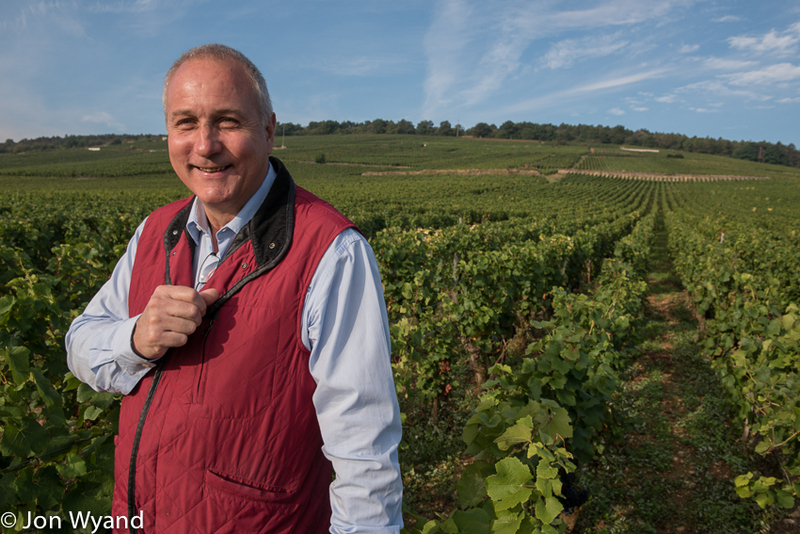 One might say Etienne is well made and humorous himself, there is certainly enough of him ! I postponed a chance to taste as he was preparing for harvest but I am assured by two friends I trust that he is a “rising” star. 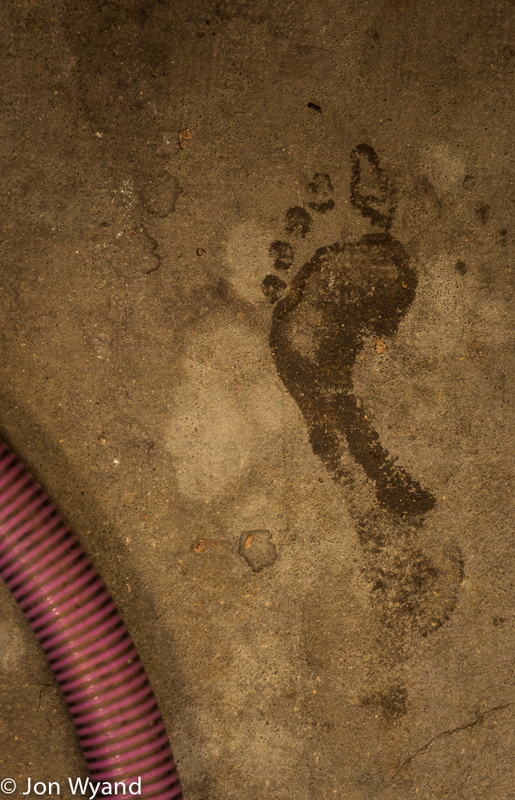 Rising but with two feet firmly on the ground. 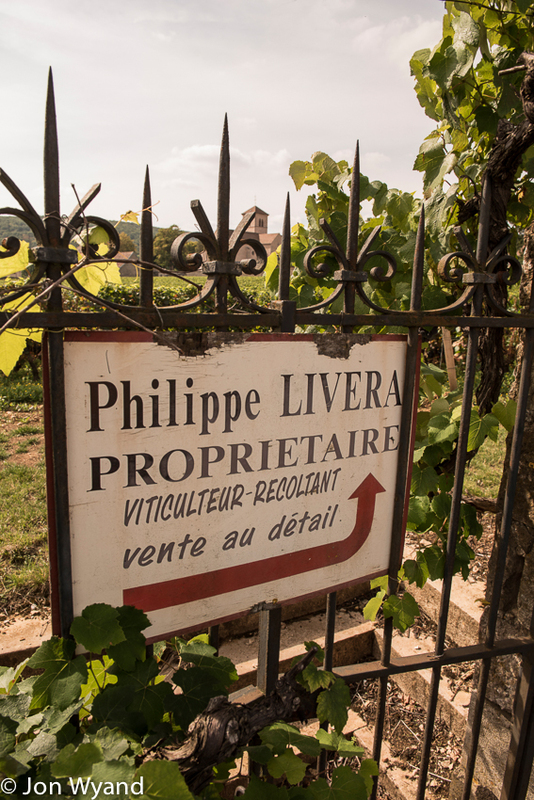 Domaine Julien’s slightly camouflaged sign. After a quick ride around Corton Bressandes, finding new tarmac and tourist signposts but not much action, I headed through Aloxe-Corton past the dismal boarded up concrete bunker that was once Reine Pedauque and had my spirits lifted by the sight of Franck Follin’s cottage. 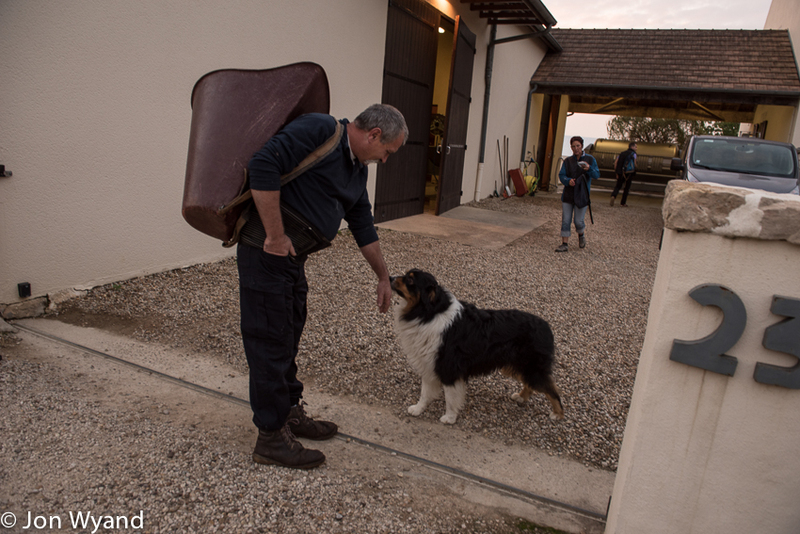 I was expected at Domaine Chandon de Briailles to discuss a day’s shoot tomorrow and in the gravelled courtyard in front of the magnificent house I am met by Claude Jousset-Drouhin and her terrier “Darling” who must once have escaped from a circus he (she ? I do not notice such things) is very agile, well trained and generally adorable. A tour of the house where her parents still live and the gardens, where her children still play is followed by discussions about time and direction of sunrise and the possibility of shutters being left open all night for a dawn start and how to open the large front gate. Darling, he should be with the angels on the label ! 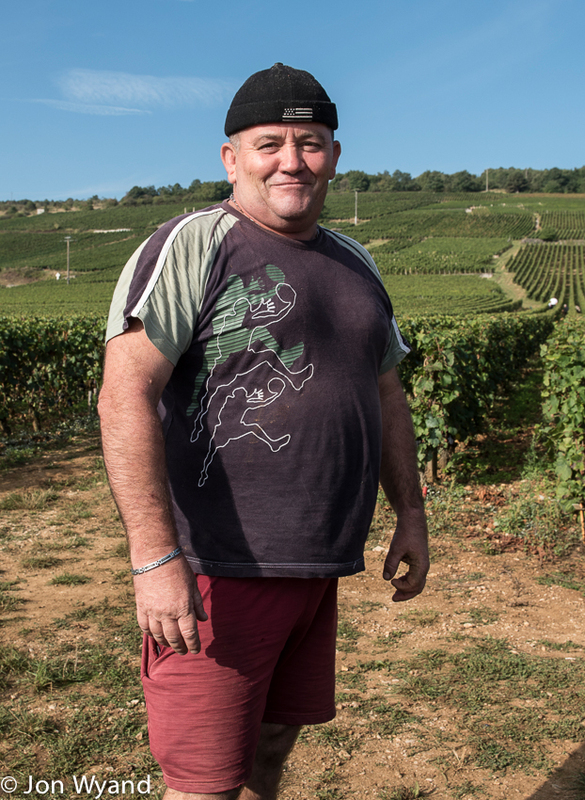 I’ve just missed François treading grapes it seems. Tuesday dawned with clear skies overhead but cloud in the east for the sun to overcome. Never mind, I had wrestled with the gates and eventually got in.. You may be able to pick your hour, and your day, but seldom the season when you have an assignment to shoot and dawn in June would have given me a better angle at first light and shooting buildings is often about angles and timing. In September the sun must find its way through the trees and is almost right behind me when it appears. 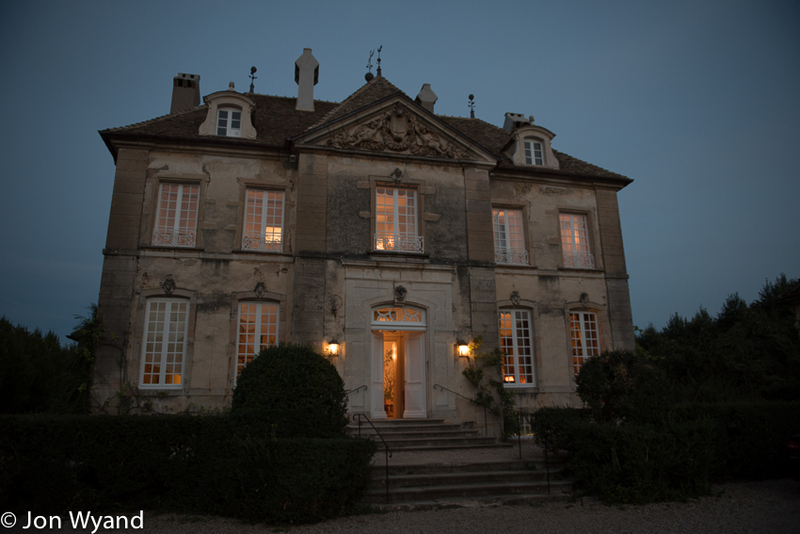 After an hour with the pickers harvesting Corton Blanc at the southerly end of Bressandes I was back to the house which was better but less interestingly lit. Never mind, casscroute comes to the rescue and there is plenty more to do and there is still the west facing side to shoot at dusk and beyond. At last François can sit down ! 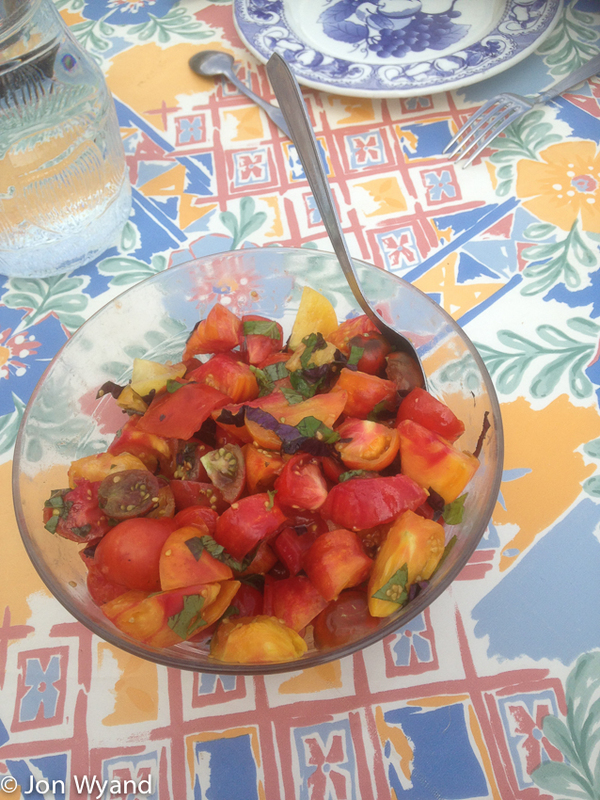 Starting with organic tomatoes from the garden. 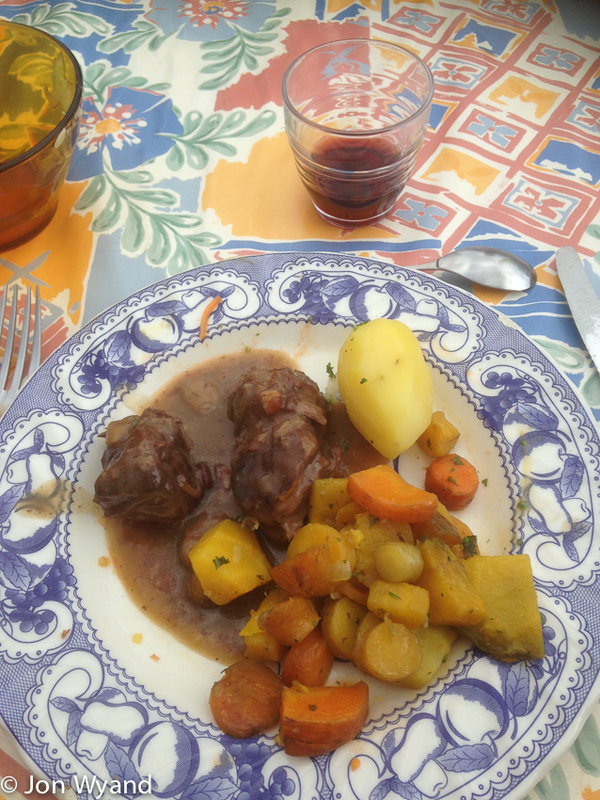 Then boeuf bourguignon with organic carrots. 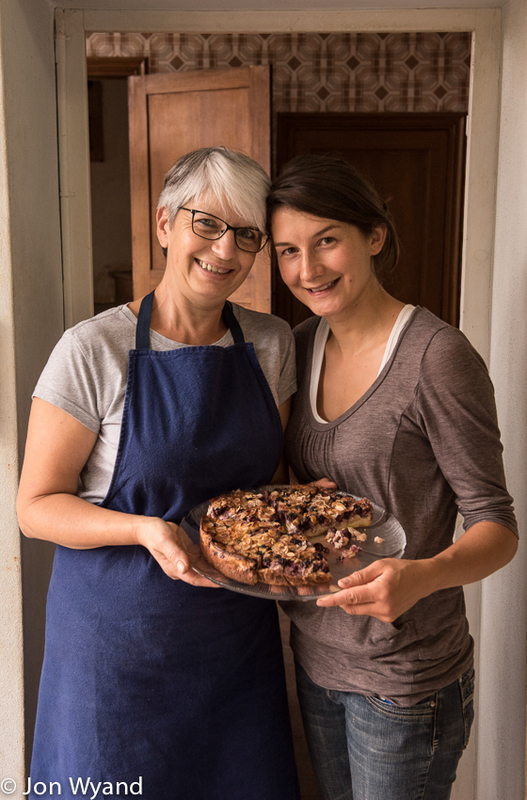 Merci to les belles cuisinières! 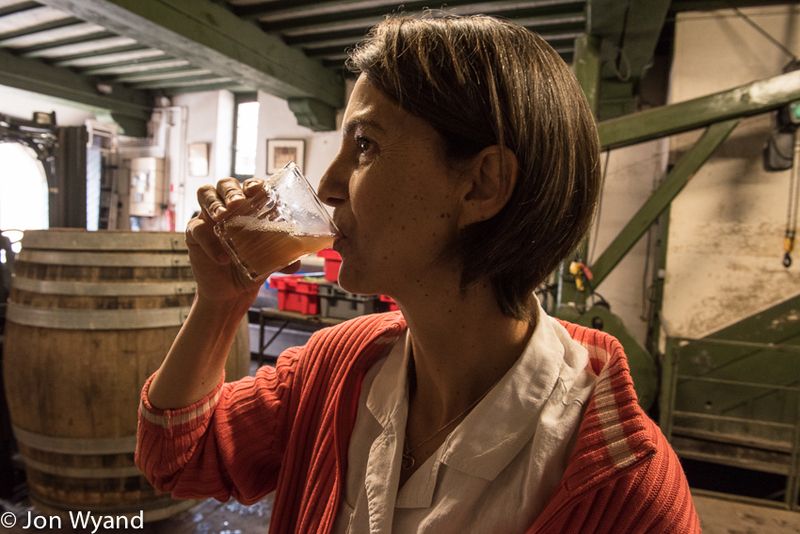 Claude sampling the press juice. Waiting for dusk and an “all lights on” shot. A long wait…. A long wait ahead for the right balance indoors and out. 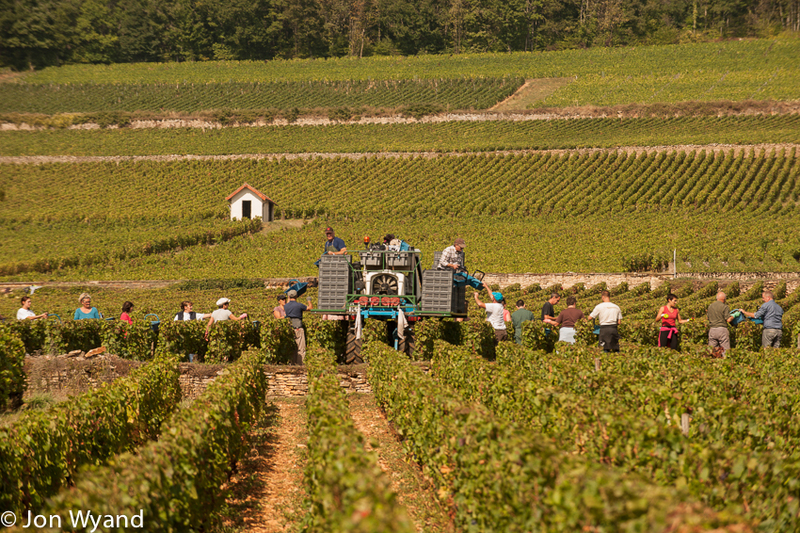 Early mornings at harvest time are great and on Wednesday I was off to Chassagne to see Vincent Dancer for the day. 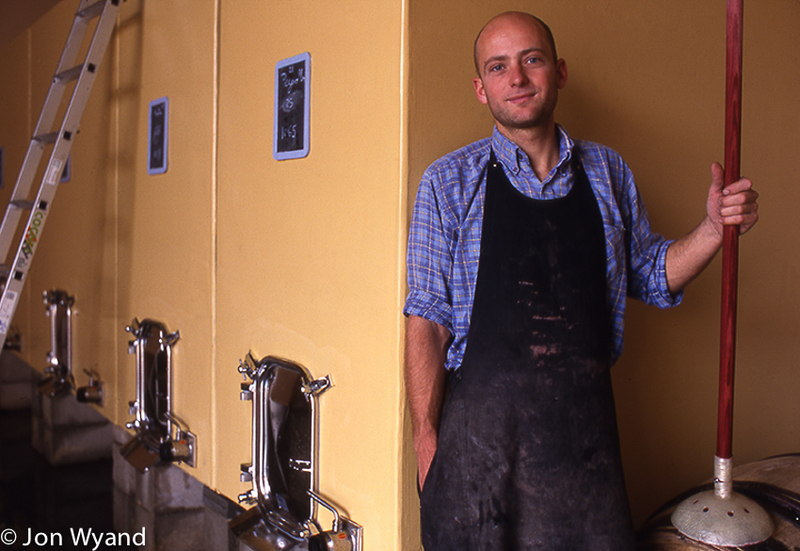 Back in 1998 I asked JancisRobinson who would be good to photograph in Burgundy and Vincent was among the names so I have known him a while. 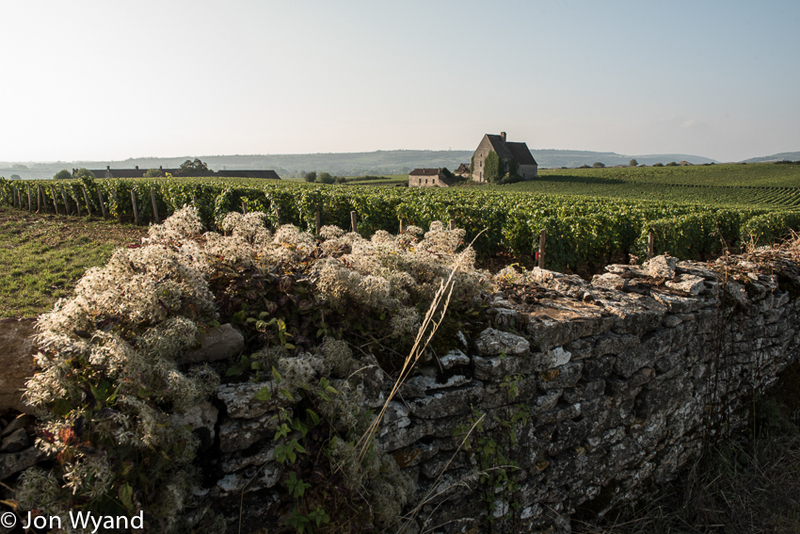 Looks like a promising day in Chassagne. Fusain checks ID at the gate. 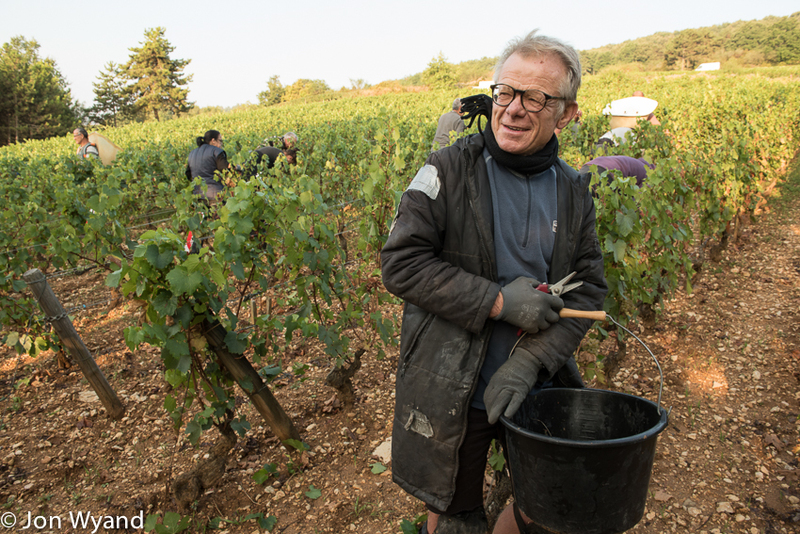 I am introduced to Marcel who is doing his 60th harvest and discover I photographed him in 2010 for a story about Chassagne-Montrachet’s St Vincent celebrations ! 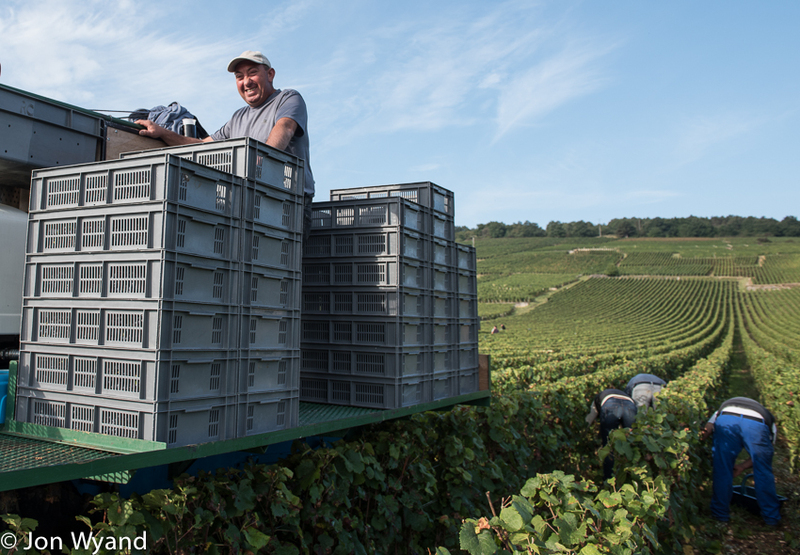 Marcel doing his 60th harvest, chapeau ! 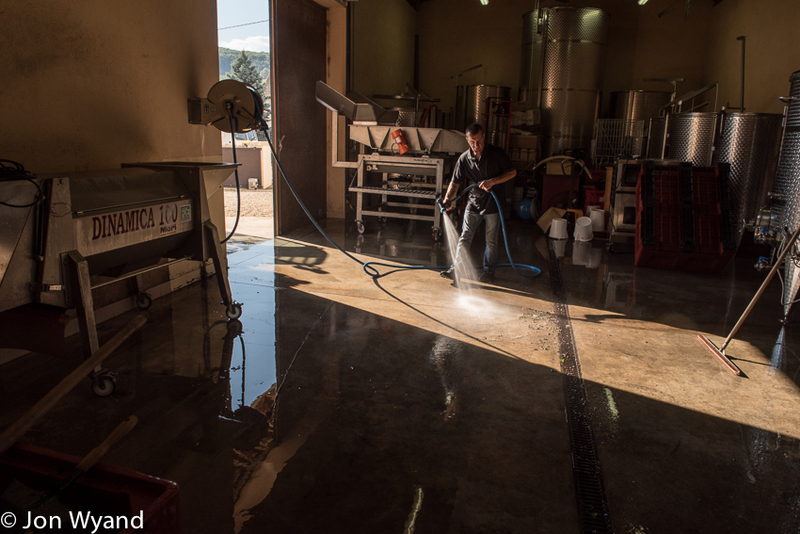 Marcel cleaning St Vincent in 2010 ! And Vincent D in 1998, that’s what exercise does for you ! 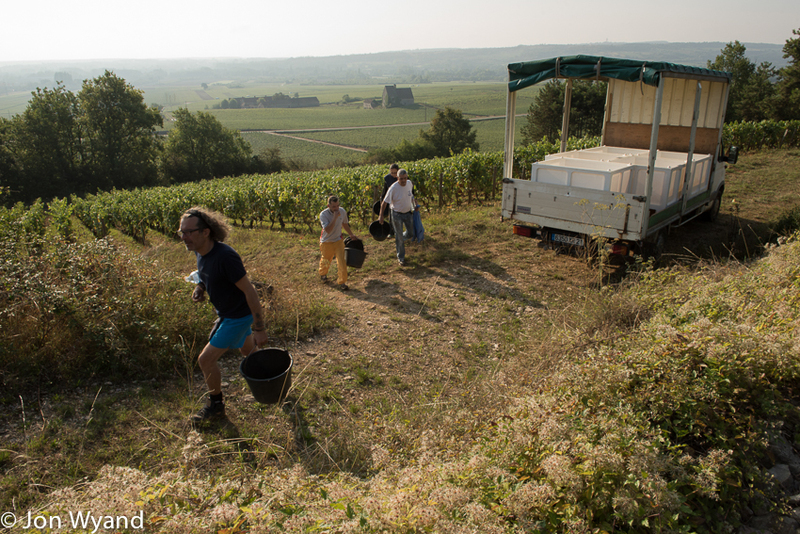 Dancer’s crew off to pick Clos du Tête in Chassagne. and tasting the juice ! 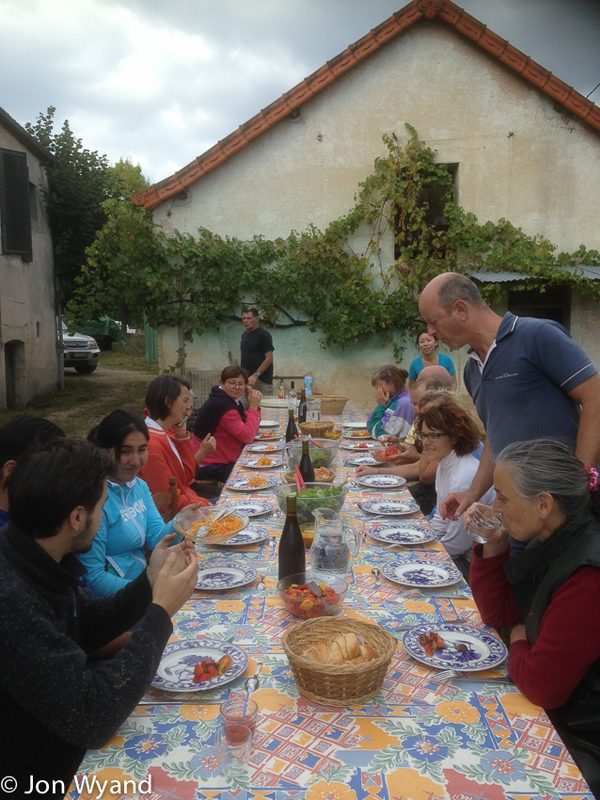 Vincent stoically comtemplates a small harvest…. 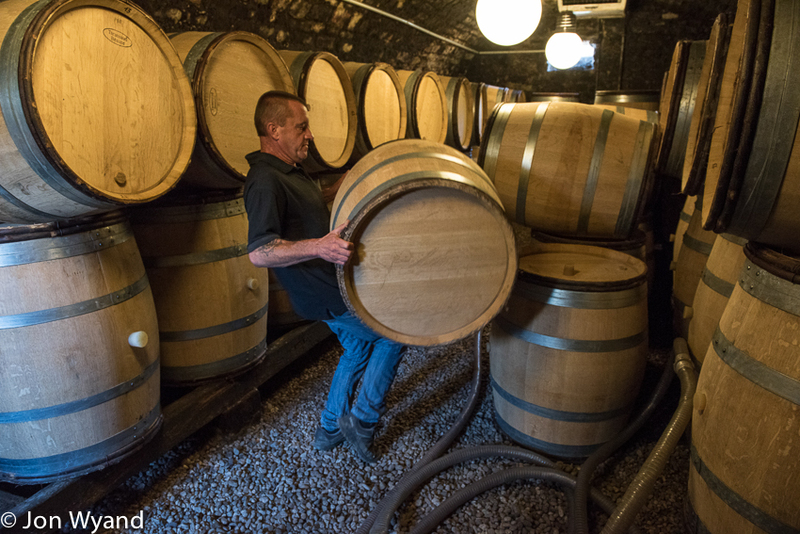 Dominique demonstrates his barrel lifting technique. After a long day I am off to be fed at Table de Gregoire, aka Greg Love. 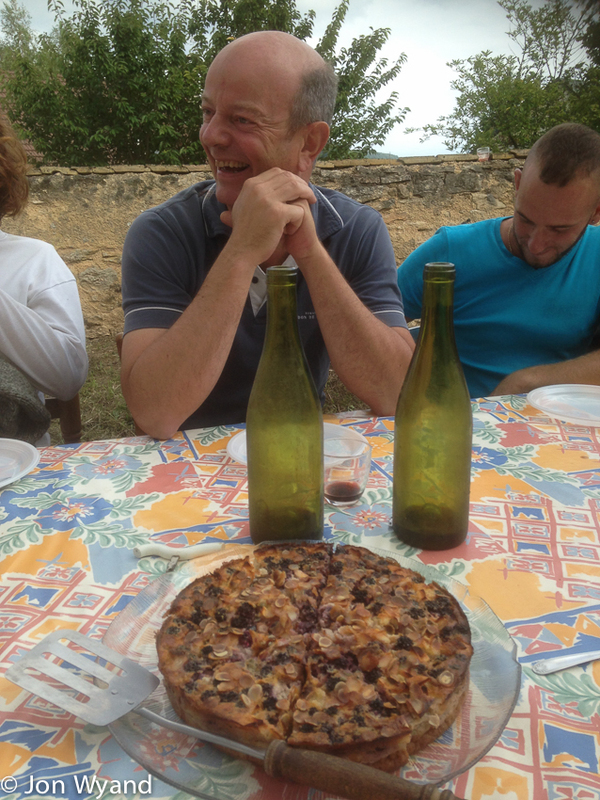 Now resident, well he was then, at Domaine Jessiaume in Santenay, we are sharing a home cooked meal tonight. I arrived bottleless (coals to Newcastle ?) 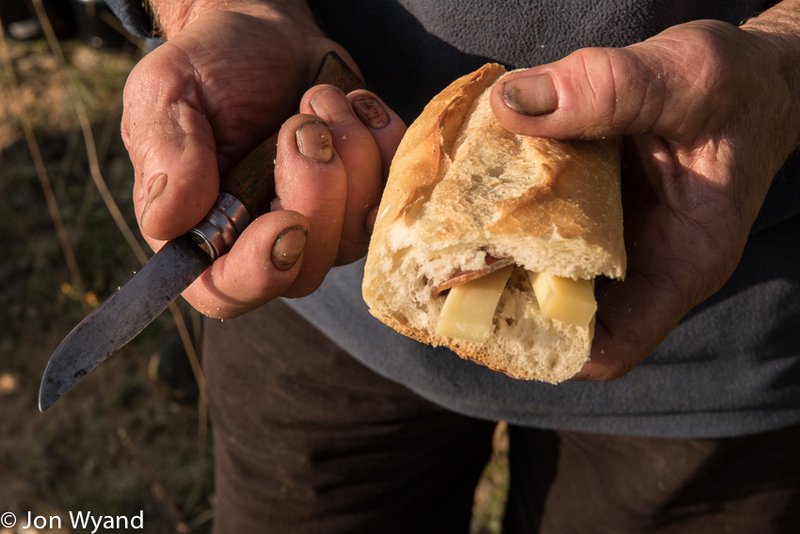 except for two jars of honey from Serge, my beekeeper friend in Ladoix. I promptly forgot to give them to Greg ! 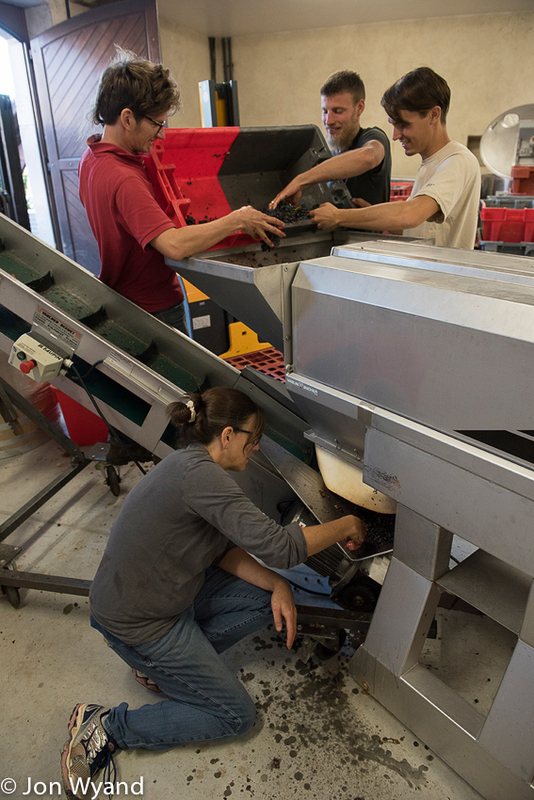 The gang at Jessiaume will be working late tonight. 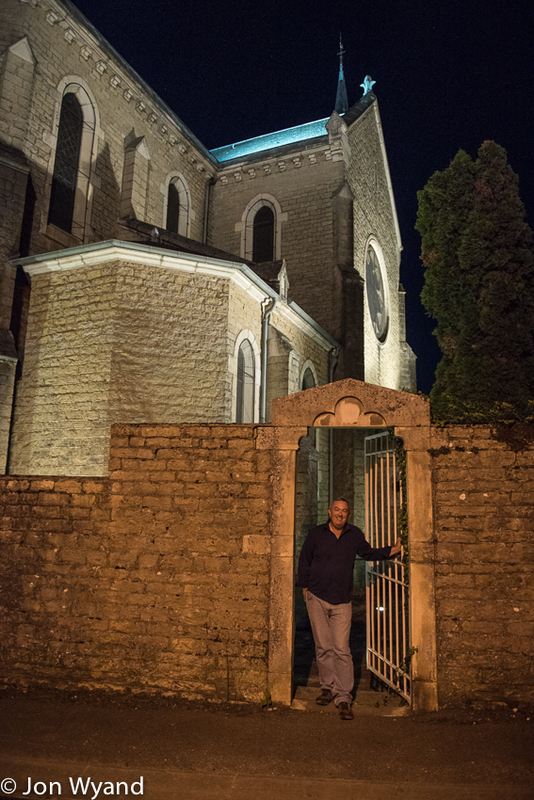 Greg takes me for an after dinner tour of Santenay. 9pm and the streets are deserted…. Having done his harvest stint Greg departed later that week and is now sampling the delights of Nepal ! 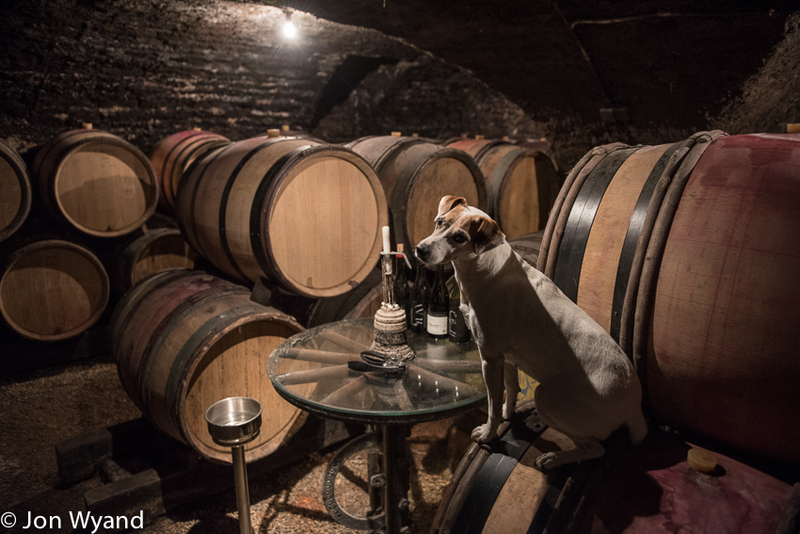 So to Thursday, a return visit to Chandon de Briailles and some free time to mop up other picture requests. A horse ploughing pic, just for me ! 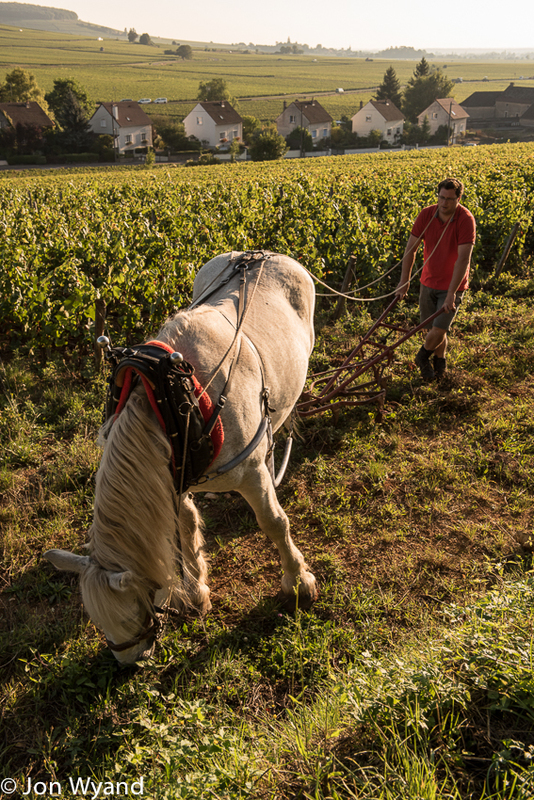 A lovely morning with Prosper the Percheron and François the vineyard manager at Chandon de Briailles overlooking the outskirts of Savigny. Prosper takes break. Somewhere in the background is Corton. Where DRC are harvesting their Bressandes in typically neat and organised fashion. 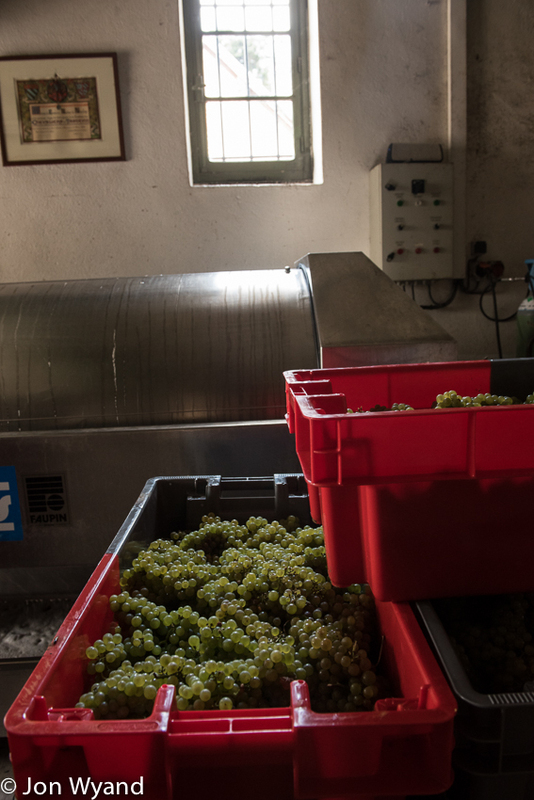 While along the road the Hospices de Beaune are gathering their’s. 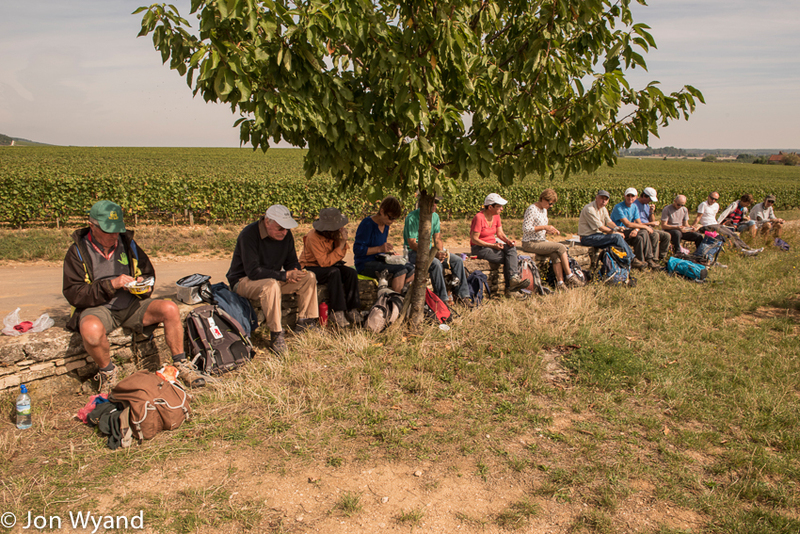 Meanwhile at Vosne-Romanée the vineyards belong to walkers. 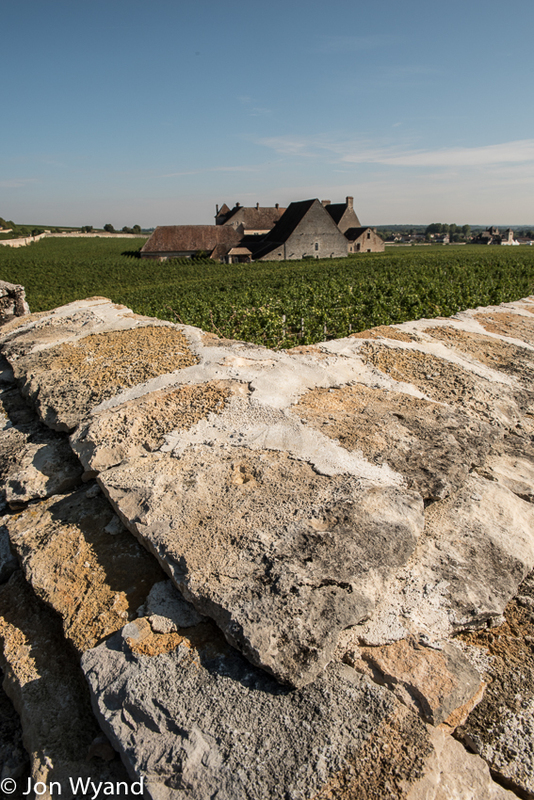 Clos de Vougeot from over the wall. 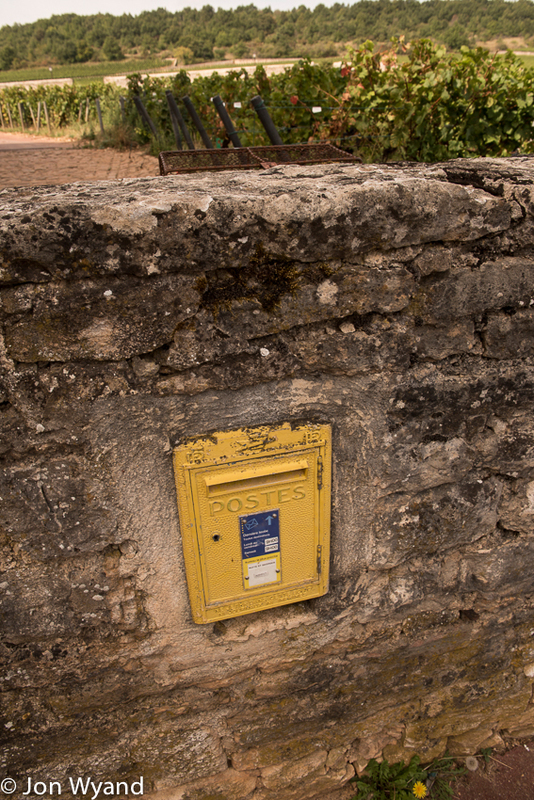 Question, which vineyard has its own postbox..? 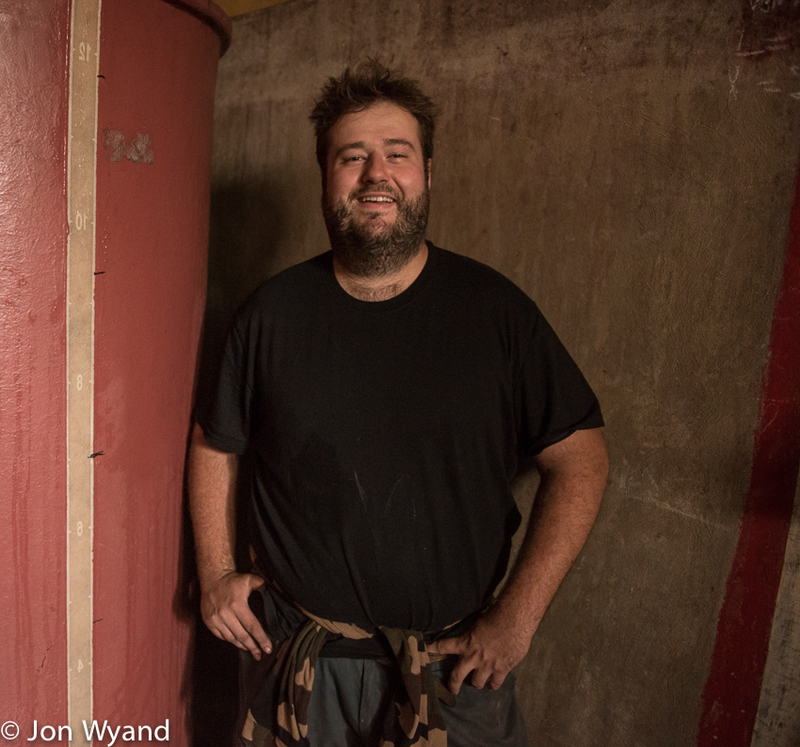 A name to watch in Gevrey, I’m told. 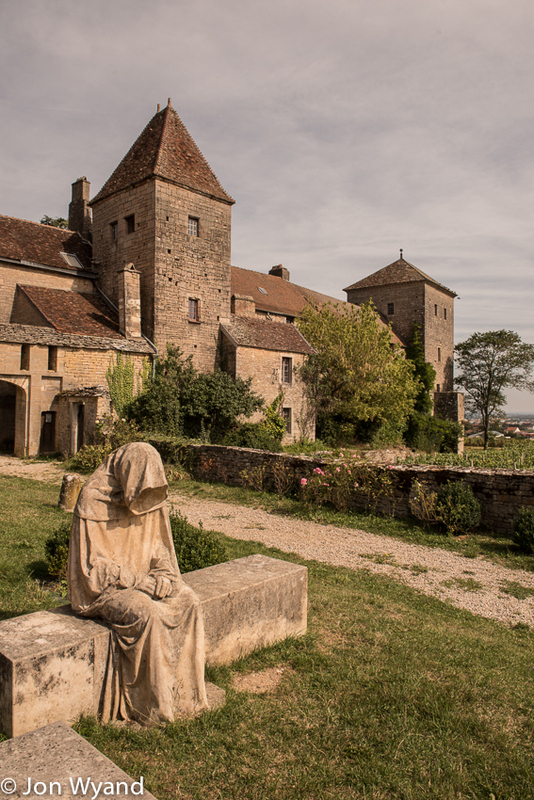 The chinese owned château at Gevrey has it’s vineyards worked by Eric Rousseau so the monk need not look so petrified ! 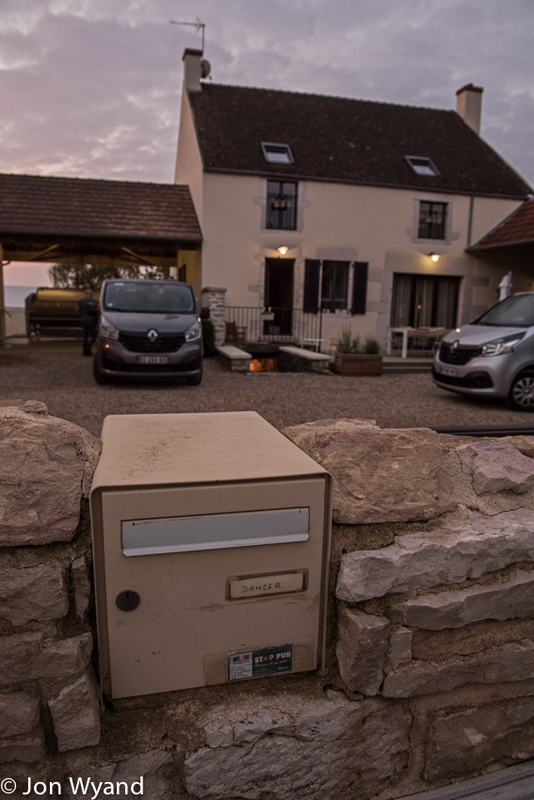 Went exploring around Marsannay. 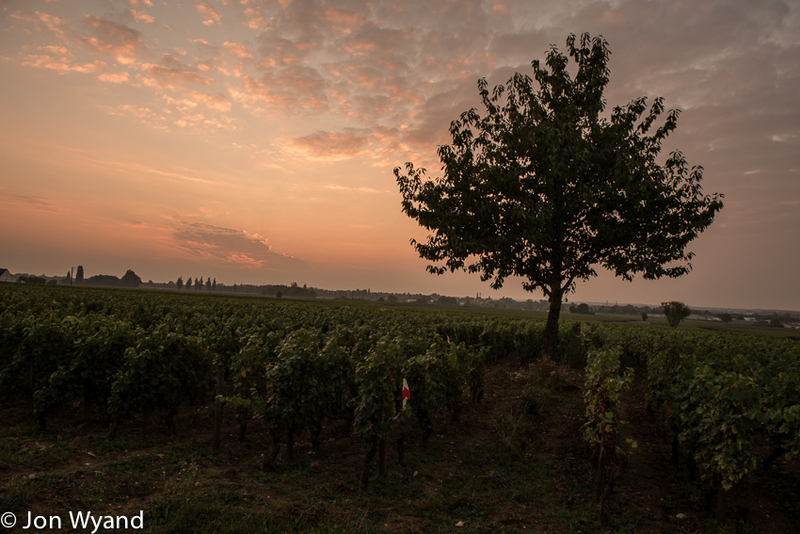 I think this is Les Grasses Têtes vineyard with Marsannay village behind. 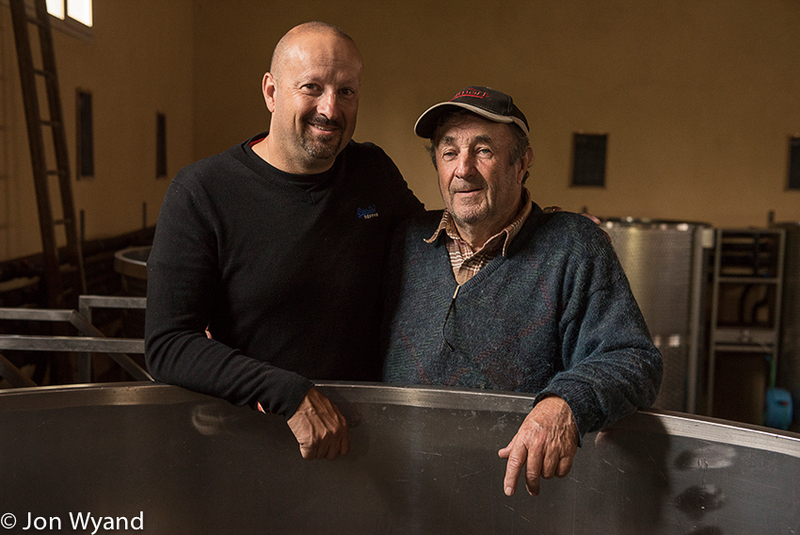 Jean-Marie and father Jean-Claude Fourrier in Gevrey. Great fun, great wine ! 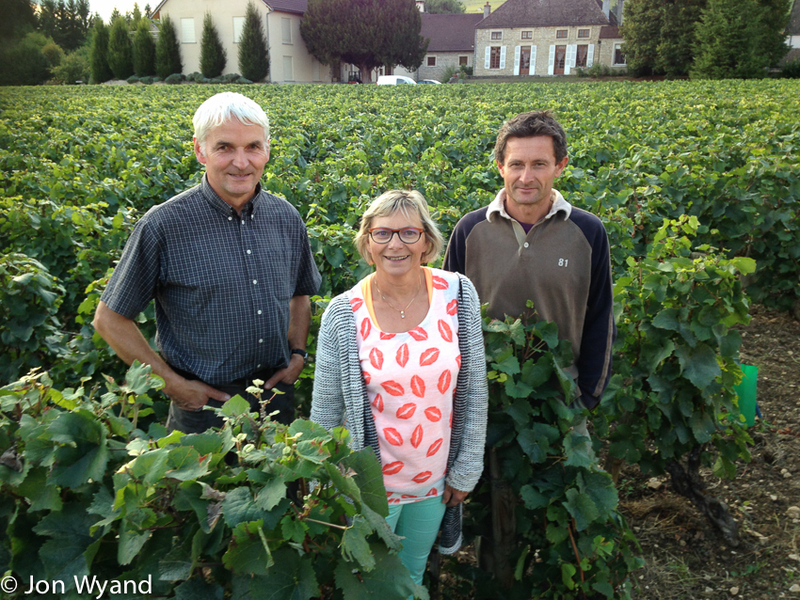 A social call on Pierre Cornu at Ladoix, then cousin Manu and wife Edith arrived. Still smiling after heavy losses to the frost. Not much Aligoté left where they are standing for example. 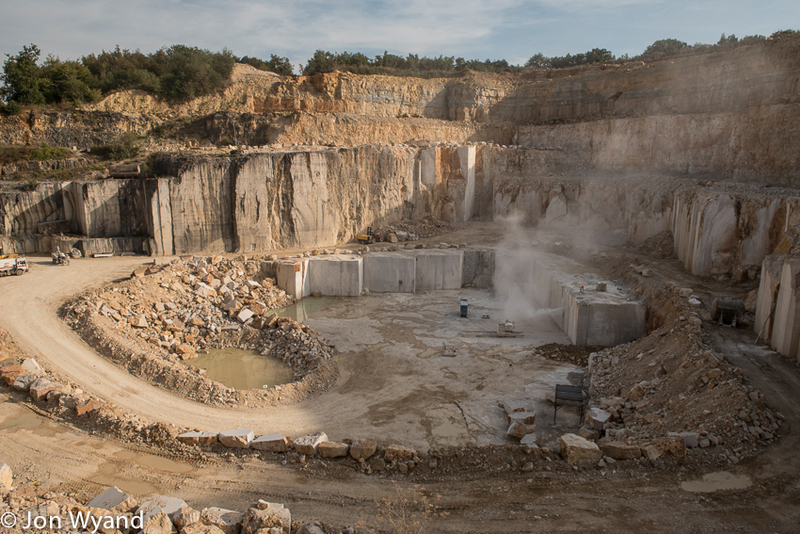 My first visit of a Burgundian quarry above Corgoloin. 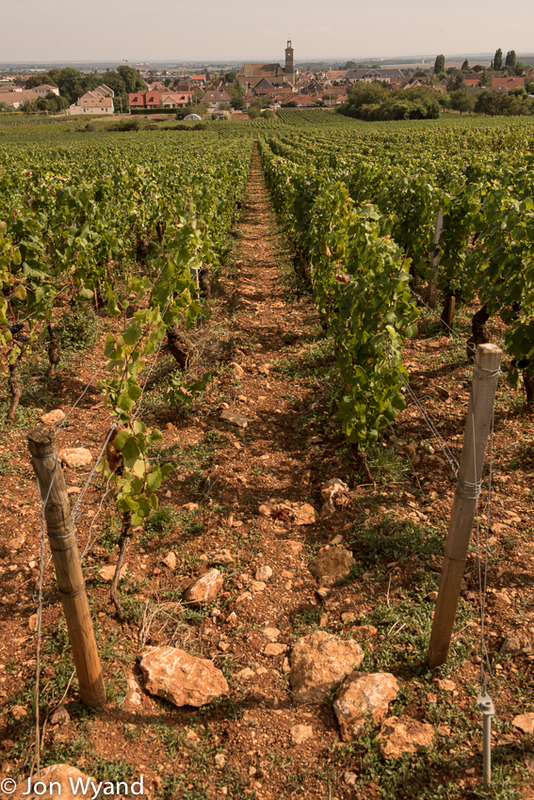 An impressive view of what lies beneath the vines elsewhere. 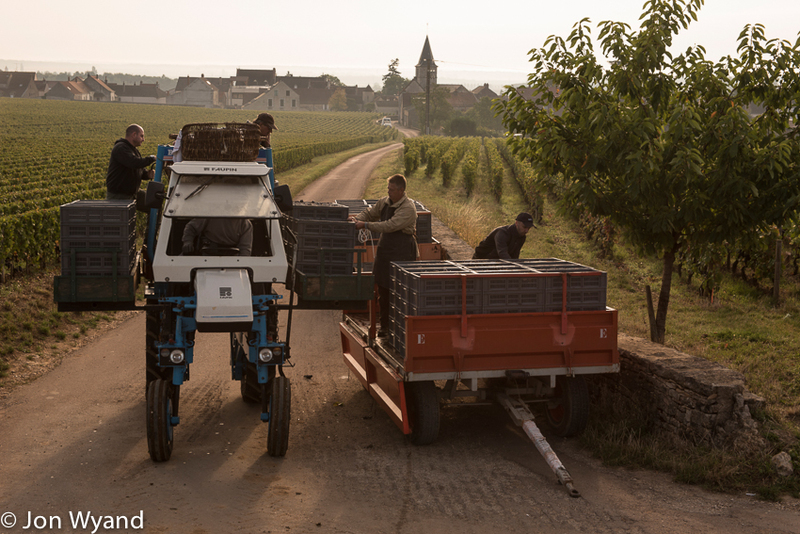 Instead of chasing the picking that is already some way up the slope I waited by the trailer and watched the unloading with Vosne in the background in beautiful soft morning light. Timeless. The guardian of Richebourg ! 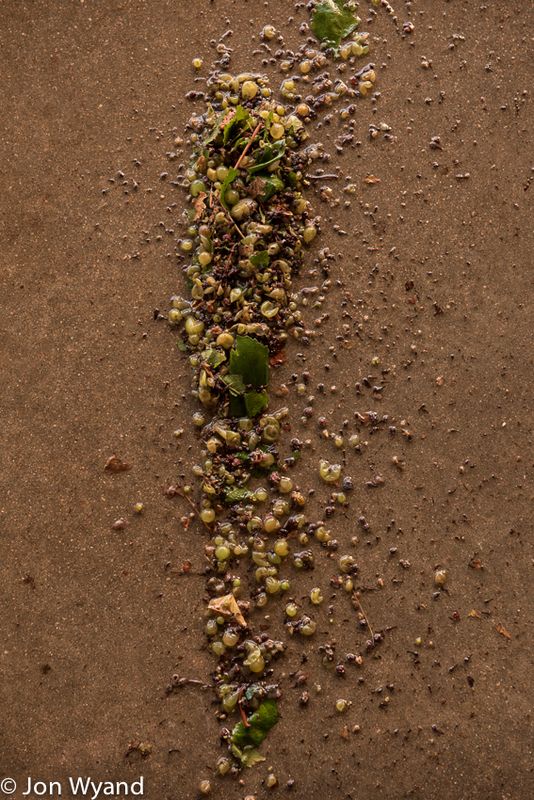 The grapes are safe with him around ! 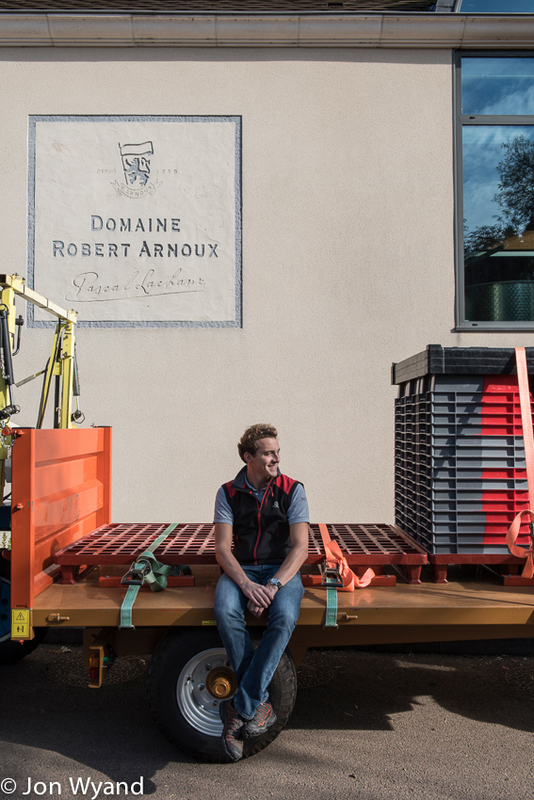 second appointment: get some stock portraits of Charles Lachaux at Domaine Robert Arnoux. Looks as if he’s ready to go ! 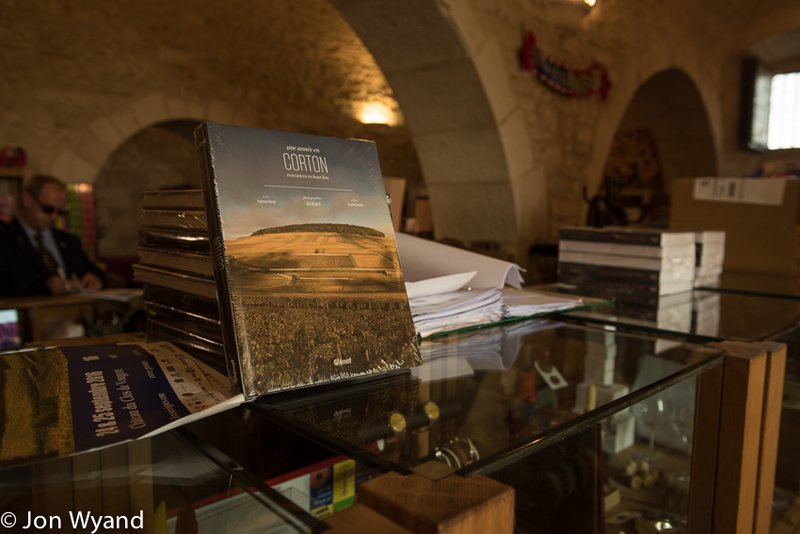 After Vosne I called at the shop in Château du Clos de Vougeot as the Chevaliers de Tastevin have promised to stock the Corton book. Its excellent news and I’m quietly proud to be on the shelf alongside some great books. But not quite yet though, they only arrived this morning ! 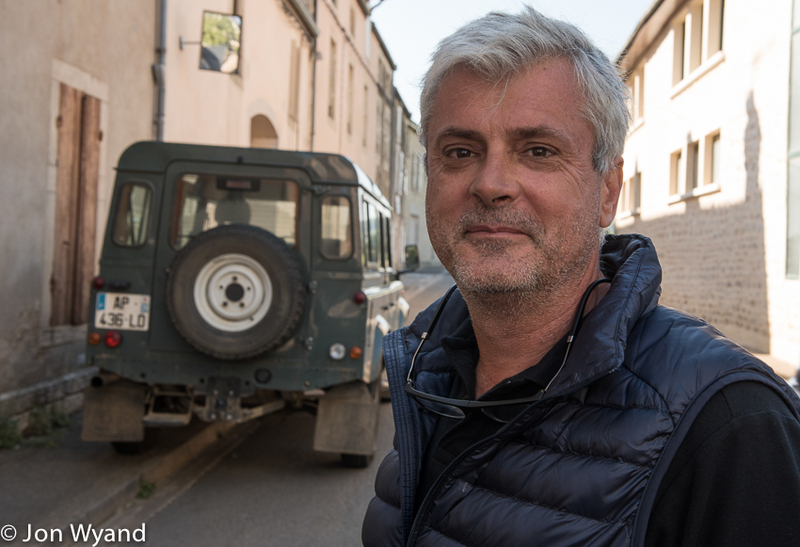 As I carried on through Morey St Denis I encountered Christophe Perrot-Minot and his Landrover and stopped to see how things are. 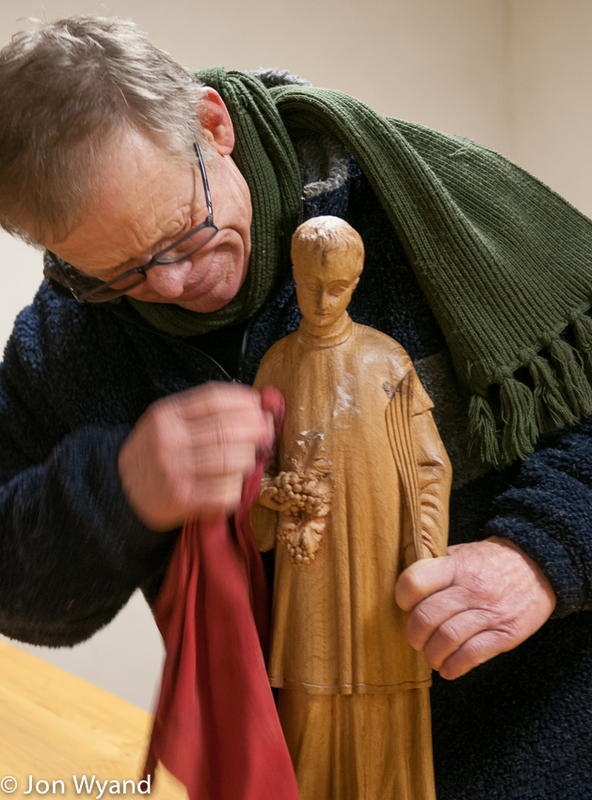 He sadly counted off on his hand the appellations he had lost to the frost. 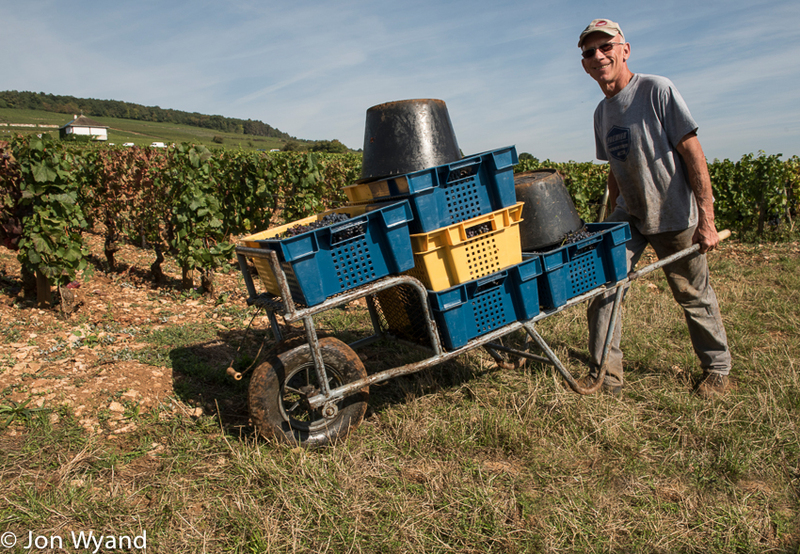 I’m leaving Burgundy after very positive week but reminded it has been a very tough year for some. This entry was posted on October 12, 2016 by jonwyand. It was filed under Uncategorized .